A rhyming and carefully illustrated adventure tale about a MOTHER'S LOVE for HER CHILD. This is a popular and cute BEDTIME STORY that your toddler will simply ADORE! Through the adventures of an adorable bird family and SEEK-AND-FIND ACTIVITIES within this picture book, your children will feel SPECIAL and LOVED! Ideal for EARLY READERS that will get the chance to learn about the world and their emotions while finding HIDDEN PICTURES AND OBJECTS in the books careful illustrations. Provide an IDEAL GIFT for your kids and STIMULATE them to learn in a fun way with this EDUCATIONAL book! - It is meant to encourage your children to develop and use their imagination and creativity from an early age. Because of its style and design that contains the rhymed story, interactive seek and find activities with the hidden pictures and great illustrations by the author, your kids' creative side will be stimulated by this book and they will happily return to it. - A great bedtime story, written in an original and funny way using rhymes and illustrations to tell a tale about the adventures of a unique bird family. If your child is a fan of Guess How Much I Love You kind of books, then it is most certainly going to love this one! There is always love between parent and child, which is the heartwarming message in this exquisite new book. - An activity book with illustrations that are filled with amazing seek and find activities that will help your toddler develop and improve visual recognition skills, focus, and matching skills. - While finding hidden pictures, your kid will be able to learn interactively about things like forest and garden and the plants, insects and the animals that live in them. It will also learn about the rain, wind and the snow and even get the impression of a changing of the season! - You can bond with your children, show them how much you love them and share those magical moments that they will always remember when they grow up, by reading this book to them before they go to sleep. Is there a better way to create one beautiful lifetime childhood memory? 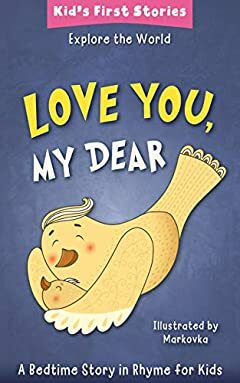 - With read-aloud rhymes, you and your children will giggle your way through Love You, My Dear and discover the fun and loving parts of your relationship. Carefully illustrated by the author, the readers will have fun turning the pages and discovering all the reasons a mother loves her child. So, what are you waiting for? Order it now and show to your child how great your love for it is!